PRIVATE TERRACE! ST.CHARLES AVE!!! GARDEN DISTRICT! Property 2: PRIVATE TERRACE! ST.CHARLES AVE!!! GARDEN DISTRICT! Property 3: Classic Uptown Shotgun, just steps to the streetcar ! Property 5: Frenchman street for awesome music and two blocks to French Quarter. Property 6: Located in the heart of New Orleans. Property 9: On Frenchmen Street - Whole House - With Courtyard! Property 13: PRIVATE BALCONY! ST.CHARLES AVE!!! GARDEN DISTRICT! Property 15: NEAR STREETCAR LINE! NEW LOCATION!! BOOK NOW! 5 minutes from FRENCH QUARTER! Property 18: French Quarter Romantic Suite with Courtyard!! Property 19: Charming Creole Caribbean in Mid City! Property 20: We're Jazzed Youre In Town! Property 22: Authentic New Orleans Charm in 1860s mansion with Fantastic Location! Property 25: Live Like A Local In Historic Architecture! Property 30: Clean and cozy apartment centrally located to everything! Old New Orleans Style Rental. Garden District, off street parking. Property 36: Old New Orleans Style Rental. Garden District, off street parking. Irish Channel Home Only 10 Mins to French Quarter! Property 38: Irish Channel Home Only 10 Mins to French Quarter! Property 39: Uptown Cottage 2/2 - Steps to St. Charles Ave.
Property 42: 1839 Victorian Private Large Room Sleeps two Garden District. 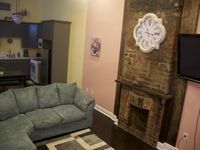 Property 48: One Bdrm Apartment, Walking Distance to Jazzfest, Close to the French Quarter! Property 49: New Orleans Home w/Patio - 2 Mi to French Quarter!